Finish Rejuvenator. Kitchen Cabinets can look new again. The Best Kitchen Cabinet Cleaner and Wood Restorer ever invented. Unique Formula of OILS and Cleaners. Dissolves grease and buildup so you can wipe it away. Never dissolves any finish. 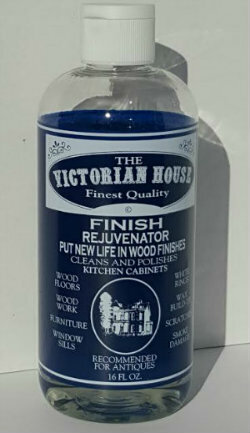 The Victorian House Finish Rejuvenator On Line. 16 oz. $26.95 Look for Free shipping. 2 BOTTLES WILL CLEAN AN AVERAGE KITCHEN Use what the professionals use. Look for Larger quantity "SPECIAL OFFERS" with 2/3/6 bottles and Free Shipping. Orders Over $65.00 Free Shipping. DIRECT FROM THE FACTORY IN OKLAHOMA . CONSTANT CONTACT- 918-396-4636 TEXT OR PHONE. We took out the middle man. Not another water base product that makes grease gummy. Invented for antiques over 35 years ago and used for all the wood in your home. Front doors to wood floors and everything between. No color or wax to leave residue and fingerprints. WHAT COULD BE EASIER? RESULTS LAST FOR YEARS WITH ONE EASY APPLICATION. Will not harm any finish. Any wood, any finish. (varnish, shellac, lacquer, polyurethane, even OIL Base painted surfaces , Formica and fiberglass). Don't use for water base paint. Made in Oklahoma since 1981. I loved the way it made my cherry cabinets look like new! I'm a professional painter and I've used this product for years. My clients can't believe how great their cabinets look after using the Rejuvenator. They believe I'm a miracle worker and are ecstatic over the final results. From DJ- The Victorian House Products Thank You so much for the review..